My home is a two storey Property situated in a small town at the foothills of Mt EtnaAnd which has been voted as one of the ten most livible towns in Italy! It has a lounge and dining room, large kitchen, meals area and family room, laundry, and bathroom downstairs and 3 bedrooms and bathroom upstairs. Outside there is a garden, a terrace, a carport and a storage room. From the upstairs bedrooms you will be able to enjoy beautiful views of snow covered Mt Etna during the winter months and spectacular views of this famous vulcano when in eruption. Everything you will need is within walking distance, shops, bars, restaurants, take- away, pharmacy, church, and the local piazza. The bus stop is just around the corner and will take you to the city of Catania in about 20 mins. 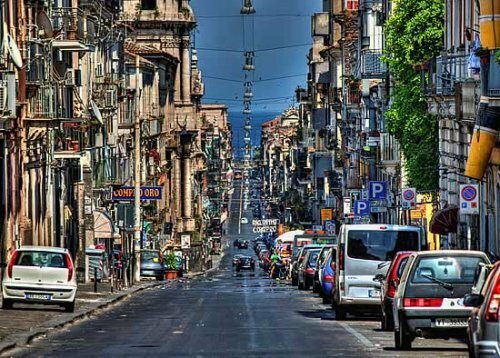 Catania is a great city with many interesting and beautiful places to visit. We live in a lovely little town, close to everything but at the same time quiet and relaxing. It is one of the more exclusive suburbs in the Catania Province. I am a 49 yr old single mum travelling with my beautiful 14 yr old daughter. We both love reading, cinema, meeting new people and discovering new places. My daughter plays the piano so you will find one at our place.